This is a great motivator for even the more difficult students. Whether it’s a behavior or academic goal, these free certificates are designed as awards for outstanding student achievement in any area you have set. 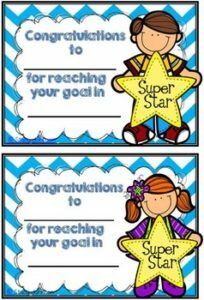 Every student can get one each week based on a goal you and the students set for that week. As always with my free products, I do love the feedback and would greatly appreciate yours.